After an excellent pregnancy and expecting an event-less labour, our son Mikail was born via cesarean birth after 38 hours of labour which had stalled and had to be restarted with induction. When Mikail would not continue through the birth canal any further, it was recommended that we try suction and that too failed, so a cesarean was completed. Mikail initially had some breathing difficulties and his apgars had to be done three times within the first ten minutes of life, but all was well after that...or so we thought. 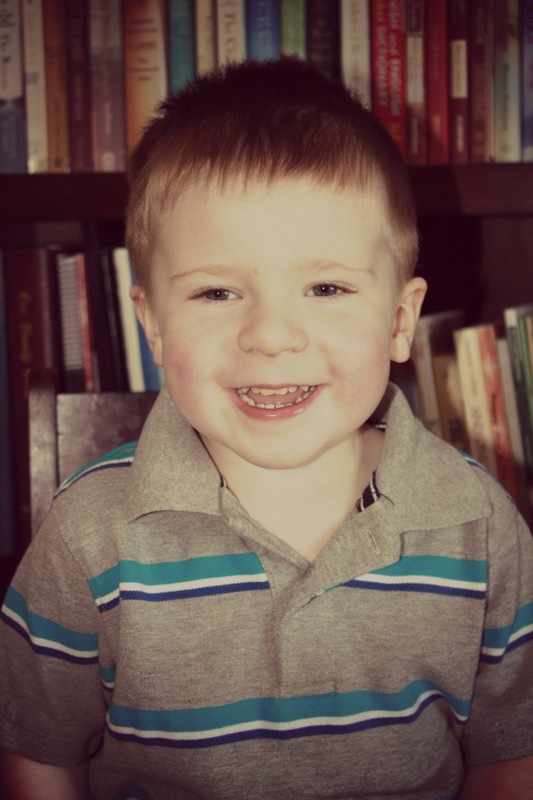 Approximately 24 hours after he was born he began having seizures. A C.T. Scan indicated a skull fracture and extreme brain damage. We were told that it was likely that he would never walk, talk, or be able to feed himself. That we would have a long difficult road ahead of us. With that news, Mikail was airlifted to the Edmonton Stollery Children's Hospital for further testing. An MRI indicated that he had sustained a cerebral infarct (stroke). The areas of the brain that were affected were the anterolateral aspect of the left frontal lobe and a large region of the left occipital lobe. The neurologists prognosis for Mikail was quite different than the pediatrician's prognosis we had initially. Yes, he would need a lot of therapy, but his estimation was that by the age of two we wouldn't be able to see any differences between him and the average 2 year old. Praise the Lord. Infant stroke is more common than we think and the causes can be many: issues with the heart, causing clots; issues in-utero; trauma at birth; and sometimes causes are not found at all. Because he had a very evident skull fracture, we believe that during the long labour, ending in a failed suction and then emergency c-section, the stroke is related to the trauma he endured during the 38 hours of labour. There aren't many places on the internet where the journey of infant stroke is shared and we hope that this is not only a good place to keep family and friends updated, but also share our heartaches and most of all our victories and accomplishments with those going through a similar journey. We will find out how much this stroke will affect him only as he develops, but so far through his many therapies and hard work, he is meeting his milestones. The biggest challenge to date is his Speech and Language development. He has a Motor Speech Disorder (often called Childhood or Developmental Appraxia of Speech) and that is what we are working on right now. It has been quite the journey, but we are blessed and so grateful. This blog is dedicated to the journey that Mikail is on in the hopes keeping family and friends up to date, but also so that others who are going through a similar journey, will find hope and encouragement. My day to day ramblings are kept separate from this blog, but you are more than welcome to check them out at Living in the Moment.